I was joking around with a friend on facebook today, and in a fit of silliness suggested a new garden product: Plantbrella. Perfect for those hydrangeas that are wilting under the hot, summer sun! In rainy areas, Plantbrella would help prevent leaf-spot fungi and it’s ideal for protecting your prize petals from bird poop! OK, I went overboard on the alliteration in that last sentence, not to mention the idea itself. 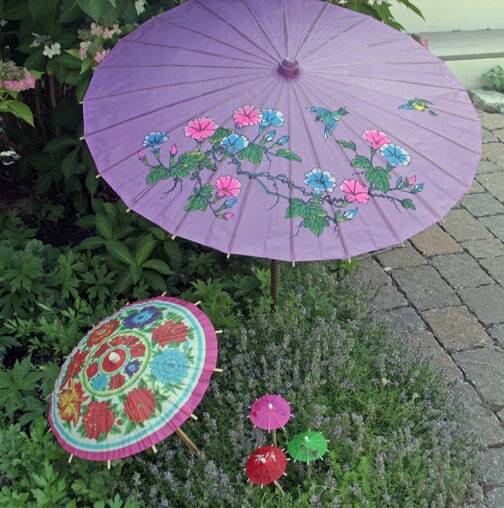 Although we gardeners occasionally want to protect our plants (floating row cover comes to mind) tiny, colorful umbrellas are probably best used in exotic drinks that are sipped in the garden, not stuck over the plants. We humans are great at thinking up a problem so we can create products that deal with that difficulty. Unfortunately, this can lead to too many choices, and too many new products. Just go into any garden center and you’ll find at least a dozen types of fertilizer, for example. No wonder so many new gardeners get confused, or downright paralyzed when it comes to so many choices. One of the first things we need to ask ourselves is if the situation is really a problem. Yes, we might see drooping hydrangea leaves, some leaf spot fungi, or even poop on prized petals. Does this mean we need to respond? In our lives we’re often tempted to immediately react when a time of reflection might be wise. Is action, or a product, really needed here? Is this really a problem?